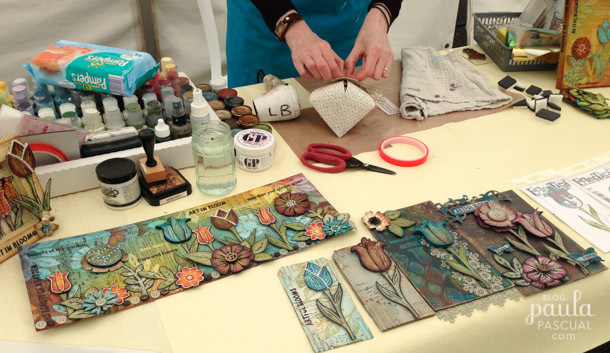 There was a big event in the craft calendar in the South of England called the Big Extravaganza at the Craft Barn. After that, the very next day, I went to Mallorca to spend some days with my sister and my niece. It was wonderful. But since then I have been doing one thing or another and had not really the time or energy to make a blog post. So here it goes a very belated one. This was my table by Sunday morning. 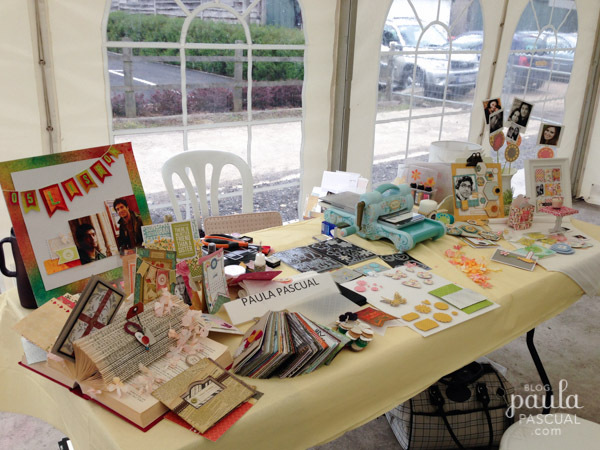 A lot of samples, on the left my Sizzix Everyday samples and on the far right the Fresh Moments ones. In the centre, the beautiful new Big Shot and the new starter kit dies. I always have such a good time at this event. A great place to see old friends and meet new ones. Thank you to everyone who came to my table. You were all so kind about my die designs and samples, thank you! 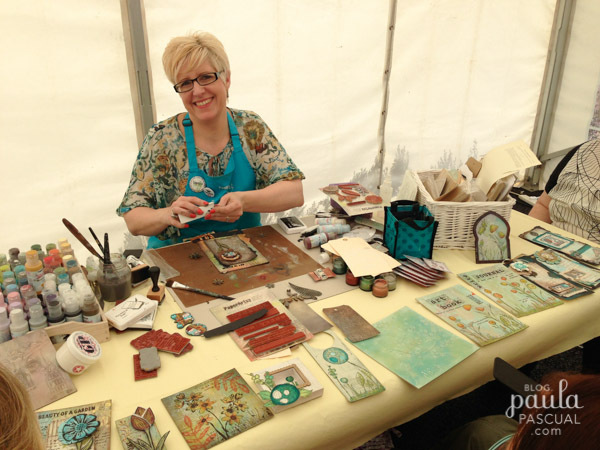 Leandra from PaperArtsy, with her lovely samples and products. I always get inspired by what she does even though she has a very different style to mine. Lin Brown, she avoids photos this one, but her stuff is like Leandra's different to mine but ever so inspiring to me. 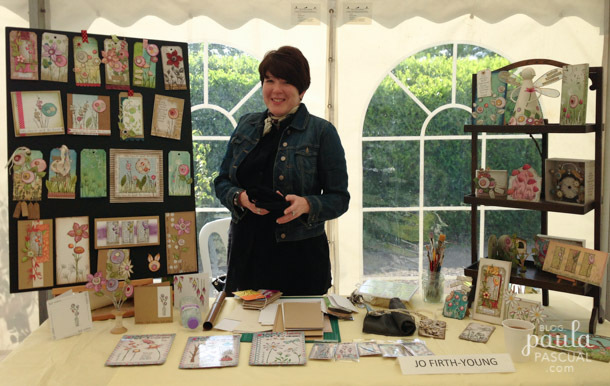 Jo Firth-Young is lovely as they are her stamps and samples. I love her colour sense! 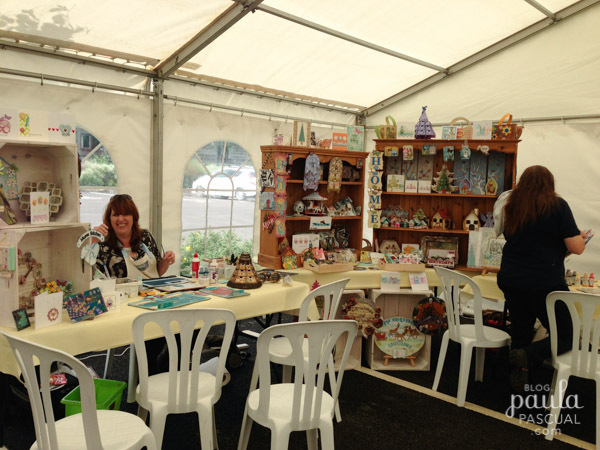 I missed a lot of demonstrators when I was taking photos early on the Sunday, but Di from Tando was there (above), so was the uber talented Andy Skinner, Francoise Read, Kay Carley, Lina McDermott, Jenny Mayes, Kay from Indigo Blue... so so many super talented crafters and some artists. I thought the new venue and organisation was outstanding something really difficult using a new venue (the Priory Farm where the Craft Barn has relocated at). This is one of this events that keep going for a very long time, I feel very strongly about this one and I hope to be able to support it for a very long time.